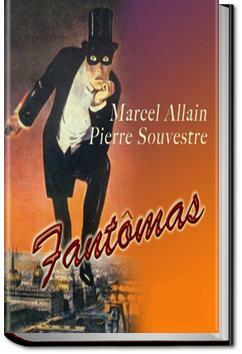 Fantômas is the first of 32 novels by Marcel Allain and Pierre Souvestre. The title character is a ruthless thief and killer, a bloodthirsty successor to LeBlanc's Arsène Lupin. The first five novels were made into silent film serials. The character and the movies caught the eye of the French Surrealists who admired the primal violence of Fantômas, as well as his portrayal in the films, which are considered landmarks in French Cinema. In Fantômas, the Marquise de Langrune is savagely murdered and Inspector Juve, who is obsessed with capturing Fantômas, arrives to solve the murder. . . ., and his age makes it most improbable that he can be a professional criminal." "Obviously, obviously!" murmured the magistrate, not a little embarrassed by the keen logic of the detective. "And now let us consider the motive or motives of the crime," Juve continued. "Why did the man commit this murder?" "Doubtless for purposes of robbery," said the magistrate. "What did he want to steal?" Juve retorted. "As a matter of fact, Mme. de Langrune's diamond rings and watch and purse were all found on her table, in full view of everybody; in the drawers that had been broken open I found other jewels, over twenty pounds in gold and silver, and three bank-notes in a card-case. What is your view, sir, of a crapulous robber who sees valuables like that within his reach, and who does not take them?" "It is certainly surprising," the magistrate admitted. There are no ghosts here, despite the title. 'Just' a criminal mastermind terrorizing the faubourgs of Paris and the countryside chateaux, cca. 1910. The famous illustration on the cover of this Penguin edition has been altered. What the arch-criminal Fantômas is grasping in his right hand is a bloody dagger which he is holding by the hilt, for which see the the original. Am I really only the fourth person in the Goodreads universe to have rated this twisty, classic-literature-yet-feels-like-an-airport-read book?